Pushan mudra is a hand gesture related to nourishment that can help with digestive and other issues. It is associated with the second, or sacral chakra, and performing it regularly may help you keep your digestive system balanced and fully functioning. 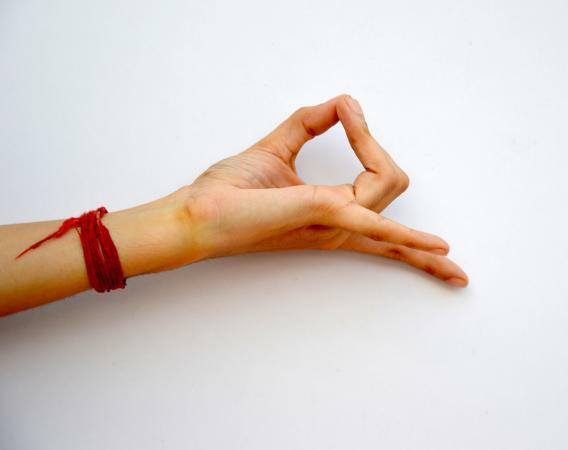 Pushan mudra is a two-handed mudra with both hands held in different positions. To start, sit comfortably in the lotus position with the backs of your hands on your knees and palms facing upward. Touch the tip of your index and middle fingers to the tip of your right thumb. Extend the ring finger and pinkie outward. Touch the tip of your left thumb to the tip of your left middle and ring fingers. Extend the pinkie and index finger outward. Hold the mudra for five minutes, resting comfortably as you meditate. You can also hold the position for an entire meditation if you wish. When you meditate, focus on the color orange and your second chakra, which can strengthen the effectiveness of the mudra. You may also wish to chant the Bija mantra for the second chakra, "vam," pronounced "vahm." Performing this mudra is an easy way to improve digestive flow and help your body receive vital nutrients from the foods you eat. It is a beneficial part of any yoga practice.